The territory of present Ashoknagar district was part of Chedi kingdom of Shishupal in Mahabharata period and Chedi Janapada in Janapada period. In medieval period was part of Chanderi State. In the 6th century B.C. Chanderi area (territory of Ashoknagar district) was under Avanti, Dasharna and Chedi Janapadas. 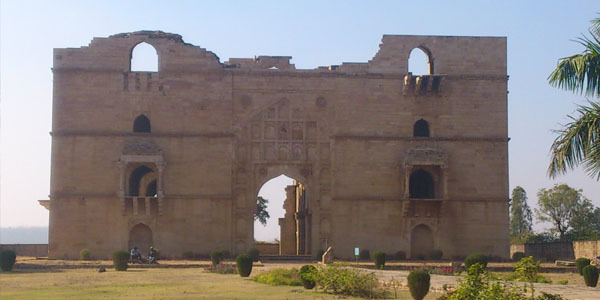 It was part of Nanda, Maurya, Sunga and Magadh kingdoms. It is believed that the Great Emperor Asoka, while on his trip to conquer Ujjain, had spent one night in Ashoknagar, hence the area been named Ashok Nagar. After the Magadh, Sungas and Sakas of Naga dynasty ruled over it. Subsequently, after the Guptas and the Maukharias, it formed part of the empire of Harshvardhan. In 8th-9th century AD, It fell to the Pratihara Rajput dynasty. The 7th descendent of Pratihara dynasty, Raja Kirtipal founded Chanderi city in the 10th -11th century AD and made it his capital. After the fall of Pratihara dynasty, the Chandelas of Jejak bhukti also ruled here briefly. Chanderi kingdom was also affected by repeated invasions of Mahmood Ghaznavi in the 11th century AD. After establishment of Delhi Sultanate, Turks, Afghans and Mughalas ruled it. During the reign of Chanderi’s Bundela ruler Morprahalad, Gwalior ruler Daulatrao Scindia sent his general John Baptiste to attack Chanderi. He captured Chanderi and also Isagarh and nearby areas. The last Bundela ruler of Chanderi Raja Mardan Singh made supreme sacrifice as a freedom fighter in 1857-58 AD. Ashoknagar is situated at the average elevation of 507 metres(1640 ft) above sea level. It is in the plateau region. It has an agricultural topography. The plateau is an extension of the Deccan Traps, formed between 60 and 68 million years ago at the end of the Cretaceous period. In this region, the main classes of soil are black, brown and bhatori (stony) soil. The volcanic, clay-like soil of the region owes its black colour to the high iron content of the basalt from which it is formed. The soil requires less irrigation because of its high capacity for moisture retention. The other two soil types are lighter and have a higher proportion of sand. The year is popularly divided into three seasons: summer, the rains, and winter. Summer extends over the months mid-March to May . The average daily temperature during the summer months is 35°C, which typically rises to around 46 °C on a few days. The rainy season starts with the first showers mid-June and extends to the middle of September. Most of the rain falls during the southwest monsoon spell, and ranges from about 100 cm in the west to about 165 cm in the east. Ashoknagar and surrounding areas receive an average of 140 cm of rainfall a year. Winter is the longest of the three seasons, extending for about five months October to mid-March. The climate of Ashoknagar is sub-tropical. In summers, the temperature reaches 47°C, while dropping to 4°C in the winter. Rainfall is adequate and sometimes less. Ashoknagar is famous for the Jain temple called Trikaal Choubeese, where the idols of past, present, and future Thirthankars, as described in the Jain religion, have been kept.The district is also famous for a small town called Chanderi, which is about 60 km from Ashoknagar. In Chanderi, ancient sculptures have been discovered in large numbers. Thubonji Sidhdha Kshetra is another one of the pilgrim centre for Jains. It is about 32 km from Ashoknagar. In the south, about 35 km from Ashoknagar, is the famous Karila Mata Mandir, which is known to be the birthplace of Luv and Kush, sons of Lord Rama and Sita Mata. A huge fair is organized every year on Rangpanchmi in which Rai Dance is performed by Bedni Women. Tumen is also a famous historical pilgrim centre situated at Triveni known for Mata Vindhyavasini temple. There are many more places of religious importance in the district of Ashoknagar. Chanderi is a tehsil of Ashoknagar district and is a famous historical & tourist palace. The main occupation of the people of Chanderi is handicraft. Chanderi sarees are famous all over the world. These are made by cotton and silk by hand through Khatka. Khatka is a self made machine for preparing sarees. Another famous place in Ashoknagar district is Sri Anandpur, the world headquarters of Sri Advaith Paramhansa Sect. Disciples from across the globe visit Anandpur twice a year during Baisakhi and Guru Purnima to seek blessings from the gurus. Kadwaya, a small village in the district is also famous for the ancient Shiv Mandir, Garhi and Mata Mandir. Economy of The district is mainly based on Agriculture. So occupation of the people there is mostly agricultural. Many people are engaged in grain merchandise. Business in the field of textiles and provisions is also quite active over here. In recent times, Commodity Exchange Market has also grown along with logistics business. Ashok Nagar is famous for its market which includes textiles, Automobiles, Utensils, Cement works, Groceries, Gold and Ornaments and almost all other things. Its a business hub and people from all around the division come over here for the trade.